If there is one race which captures the mind it has to be the Grand National. This April 8th will be no different from many before but if you want to watch the most famous steeplechase in the world make it all the more tantalising to login to William Hill to bet on the Grand National. A testing course of 4 miles 3 ½ furlongs. Forty horses will make the line-up. Two demanding circuits, 30 fences, and run in that saps the energy of all but the winning horse. It's enough to make a young horse feel old. This leads into the fascinating question. Who is the oldest winner of the Grand National? Well, we can answer that quite simply but we need to go back into the archives to 1853. In this year a horse called Peter Simple won at the age of 15. This bay gelding was trained and ridden by Tom Oliver in the ownership of Josey Little. He was 9-1, so his seniority didn't deter bettors. What may surprise readers is that this was Peter Simple's second win of the Grand National. He won in 1849 aged 11 when trained and ridden to victory by Tom Cunningham owned by Finch Mason Jr. 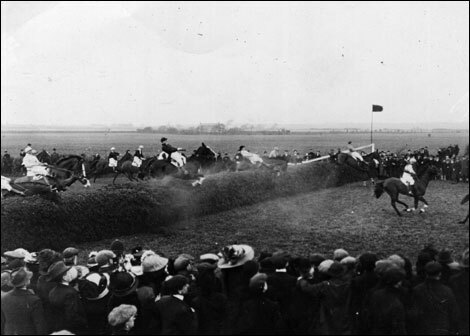 In fact, four other horses have won the Grand National twice: The Duke 1836, 1837, Abd-El-Kader 1850, 1851, The Colonel 1869,1870 & Reynoldstown 1935, 1936. The only horse to win three races is the legendary Red Rum who proved successful in 1973, 1974 & 1977. Ginger McCain's star was also runner-up on two other occasions. But back to the old timers who have proven, they can win almost at any age. Peter Simple defied his age because the next oldest horses to win were aged13. So just 3 horses have won aged 13-years and older. In this modern era, horses aged 12 are not without a fighting chance. In fact, 7 horse have won since 1969. The most recent trained by Ginger McCain, who made the headlines with Red Rum, but this time it was Amberleigh House in 2004. Ridden by Graham Lee, he was returned at odds of 16/1. This bay son of Buckskin was an exceptional jumper and raced over the National fences at Aintree on 11 occasions (5 in the National) without falling. He made his Grand National debut in 2001 when bought down at the Canal Turn, the 8th fence. His second best performance in the National came in 2003 when finishing third behind Monty's Pass. Looking at this year's entrants, there are a couple of horses that may well run age 12. Maggio is trained by Patrick Griffin and presently odds of 50/1. The only other runner who may just sneak into the maximum 40 entrants on the day is Raz De Maree trained by Gavin Cromwell. This son of Shaanmer is priced 40/1. In recent years horses aged 9 – 11 years of age have proved best.